One of the most popular home renewable energy guide on the internet is Earth4Energy manual. The e-book has been offered on the web for more than a year and it is still the top selling e-book on residential green energy system. The Earth4 Energy guide sells in the thousands of copies a month. Even though it’s a hot product, still many people may not have heard about it. That’s the reason I want to do a special review on the e-book. Firstly, Earth 4 Energy main web site is at www.earth4energy.com. 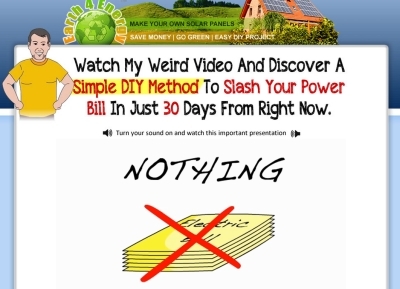 When you first visit the web page, you will see a big red title telling you “How to make your own solar panel for less than $200”. You can see the screen capture in the picture above. It’s a pretty bold statement. The question is, can it be done? Having read the manual, making your own DIY solar panel for less than $200 is definitely possible. In actual fact, you can get it done with less than $100. Here’s the catch and many people missed this point. The budget of less than $200 is for 1 solar panel, not the whole solar power system. The DIY solar panel design as recommended in Earth 4 Energy is capable of generating about 18 volts and approximately 75 watts of electricity on a sunny day. This is done by using 36 pieces of Photovoltaic (PV) cells. The panel is sufficient to charge a 12 volt deep cycle battery which can then be used to power your home electrical appliances. To setup a complete residential solar energy system, you will need to investment more than $200. There are multiple components in the system such as DC disconnect, electric gauges, switches, charge controller, battery bank, power inverter, circuit breaker etc which require some capital investment. The key to making a cheap solar module is preparation. You have to spend some time to source for the PV cells. What the Earth4Energy manual does is to show you how and where to source for cheap building material and parts. When you have located the parts and components needed, the e-book also comes with 7 High Definition (HD) step-by-step instructional videos. The picture above shows the the first introduction video of Earth4Energy. If you have no idea how to get started on your DIY solar module, the videos will come in very handy. Making your own homemade solar panel with less than $200 is not difficult. However, it does require some leg work, time and patient. Some people do not have the patient. If you are one of this people, the best option is to buy a readymade solar panel for homes. If you are working on a small budget, the Earth4Energy e-book will show you how to get the most out of it.